Fans pound on the glass as they show their displeasure with referee Justin St. Pierre during Game 1 of an NHL hockey first-round playoff series. Kerry Fraser, a former NHL official who worked more than 1,900 regular-season games and 13 Stanley Cup Finals from 1980 through 2010, remembers calling penalty after penalty on the Philadelphia Flyers early in his career. “They were a very aggressive team,” he said during a phone interview. “Especially in Philly, they played really tough,” with players like Paul Holmgren and Craig Berube intimidating the opposition with their physicality. They would take penalties because they could kill penalties, knowing they had a stout goalie in Ron Hextall minding the net. When Fraser reffed Flyers games at the Spectrum, he was on the lookout for penalties committed by the home team. But he was also hyper-aware of what the other team was doing because he didn’t want to miss an infraction. Fraser was conscious of any widening gap between the number of penalties called on each team, even if the calls infractions were warranted. The stats suggest that other referees are as well. 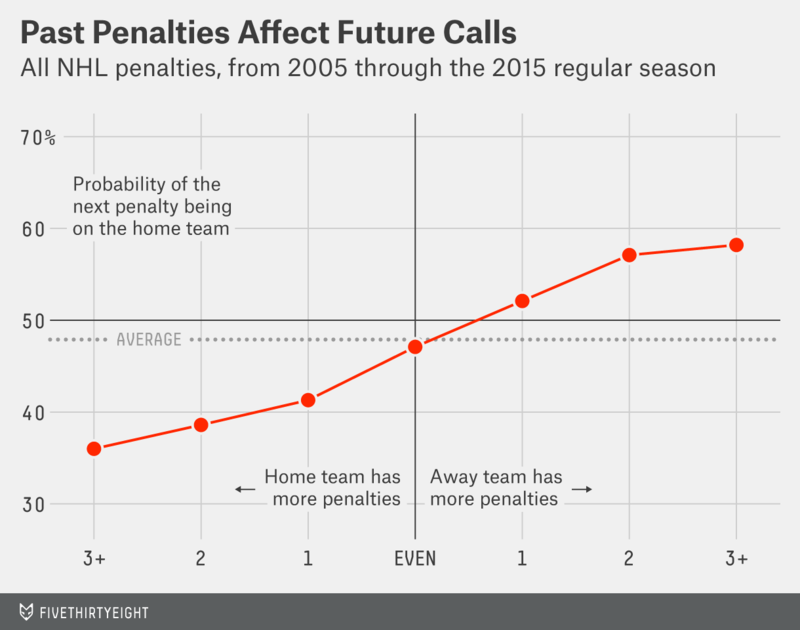 This is pretty compelling evidence that referees’ past calls influence their next calls. The chart includes every NHL penalty call between the start of the 2005-06 season and the end of the 2014-15 regular season,1 and it looks at all infractions in a game and how the difference in penalties called on each team affects the next call.2 As an example, if the home team has been called for three penalties and the away team five, the away team would be “owed” two calls. The tendency for prior violations to affect NHL penalties is enormous; when home teams are owed penalties, they are called for penalties at much lower rates, and the inverse holds for away teams. The effect is even more pronounced when a string of penalties against the same team starts a game. If a game starts with four straight penalties against the away team, for example, the home team is about three times as likely to be called for the next one. Overtime produces the most dramatic results, with the second penalty call of the extra period about three times as likely to be whistled on the team that received the first power play. Take Game 1 of the first-round match between the Chicago Blackhawks and the Nashville Predators in Nashville, Tennessee, as an example. At the 12:42 mark of the first overtime period, Chicago’s Brad Richards earned a two-minute penalty for a high stick on the Predators’ Ryan Ellis. Minutes later, Chicago’s Duncan Keith hauled down Nashville’s Taylor Beck just as Beck skated past the blue line alone. It appeared to be a textbook holding call, if not a penalty shot. However, neither referee Dan O’Halloran nor his partner, Brad Meier, sent Keith to the box. The Blackhawks avoided a second 5-on-4 situation and extended the game. It wasn’t hard to predict what was coming next: Less than three minutes after the teams returned to even strength, the Predators’ Seth Jones was sent to the box for tripping Bryan Bickell. It was a soft call, but it was one that went against the home team, evening up the number of penalties on each team in the overtime period. Keith was again the focal point of the game in the second OT, when he scored the game-winner. Of course, there are other factors, such as style of play after spending time on special teams, or perhaps even a revenge factor, that could drive these results. But there’s more evening up of calls in the playoffs, where we’d expect players to have less incentive to retaliate given the higher stakes and closer games. Further, one factor that does not seem to account for the tendency of past calls to affect future ones is the game’s score: The shape of home-team penalty frequencies is the same as on the chart above, no matter the score. While referees attempt to even out penalty or foul calls in other sports like basketball,3 baseball4 and soccer,5 the balancing effect may matter most in hockey, possibly affecting the outcome. Southern New Hampshire University’s Kevin Snyder and Mike Lopez (one of the authors you’re reading right now) found that for postseason games tied through the first period, the team that was owed a penalty was 20 percent more likely to come out on top. And, unlike in basketball, which penalizes players and teams for having too many fouls (through the free-throw bonus and the player cap at six fouls), hockey players and teams are free to rack up penalty after penalty, if they so choose. We used play-by-play data from the nhlscrapr package in R. To eliminate the possibility that our findings would be driven by coincidental penalties, which often don’t give either team a power play, we dropped all infractions that occurred simultaneously. The margin of error for each probability was less than 1 percent. University of Texas at Austin professor Jason Abrevaya gives the penalties for exact sequences of violations in a paper in the Journal of Quantitative Analysis in Sports. See this research from Paul Gift, or this study from Cecilia Noecker. Check out Etan Green’s work. Find Babatunde Buraimo’s study here.